Pompon! I don’t know which makes me happier, the sound of the word or the tactile pleasure I derive from the object itself. 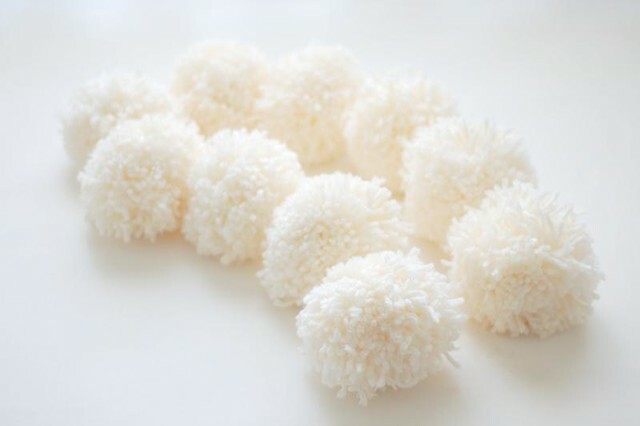 Don’t they resemble coconut balls from a distance? Image credits: one, two & three. 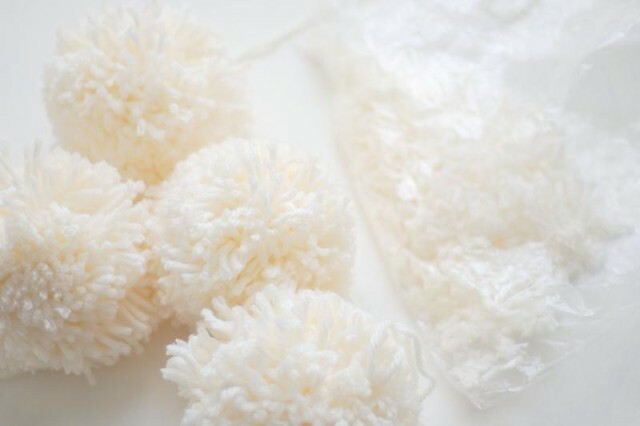 I’ve been doing a lot of stash-busting lately, partly to make room for my Ice Yarn hauls (of which I have another to document), and when I saw this adorable pompon scarf from Anthropologie, it seemed like the perfect solution to some cream acrylic I had left over from my novice knitting days. She wound hers so tight that it took a lot of effort to cut through, and my poor template looked quite battered afterwards, but she did create a pompon that all other pompons can aspire to, and that only needed some light trimming. Mine all needed shearing! Never mind, the offcuts will be good for stuffing. 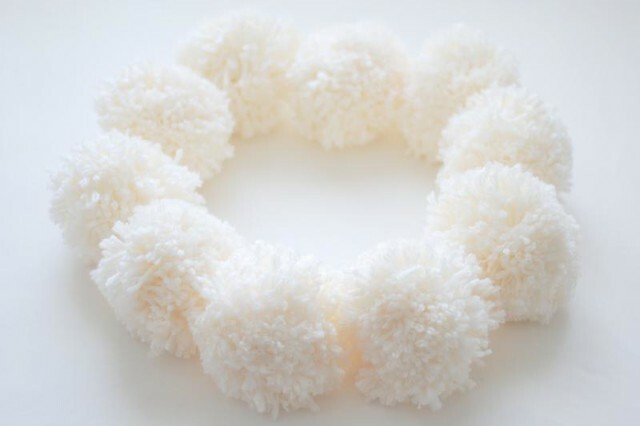 I made 10 pompons in total and used about 400g of aran-weight acrylic yarn. In my opinion, this is definitely a project for cheap yarn, even if you wear it around your neck. 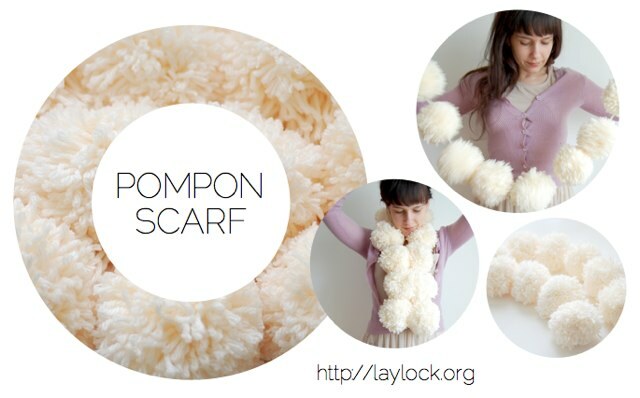 Use a surgeon’s knot when tying your pompon up. It’s just like a regular knot, but you pass the end of the yarn through the loop twice. This keeps the knot from sliding before you make another overhand knot. Useful for bows too! 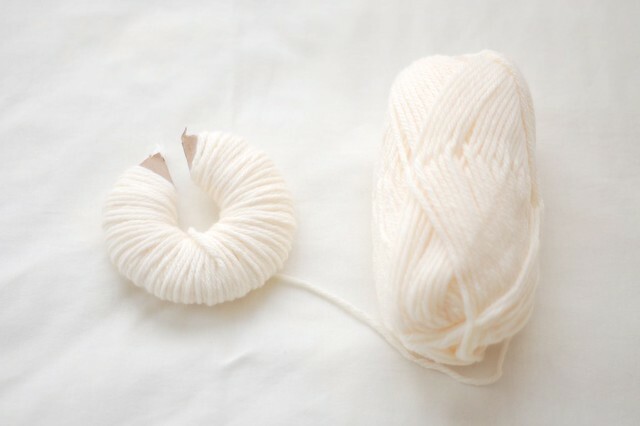 Leave the ends of the yarn you use to tie up long, as this makes it easier when it comes to attaching your pompons together. Thread both ends of the yarn through a large tapestry needle. 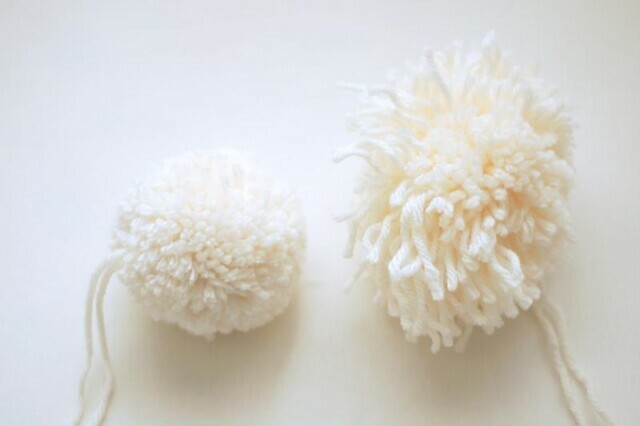 Align the next pompon so that its strings point up, and poke the needle into the bottom of it, pulling until the loop left is as long as you want the gap between your pompons to be. 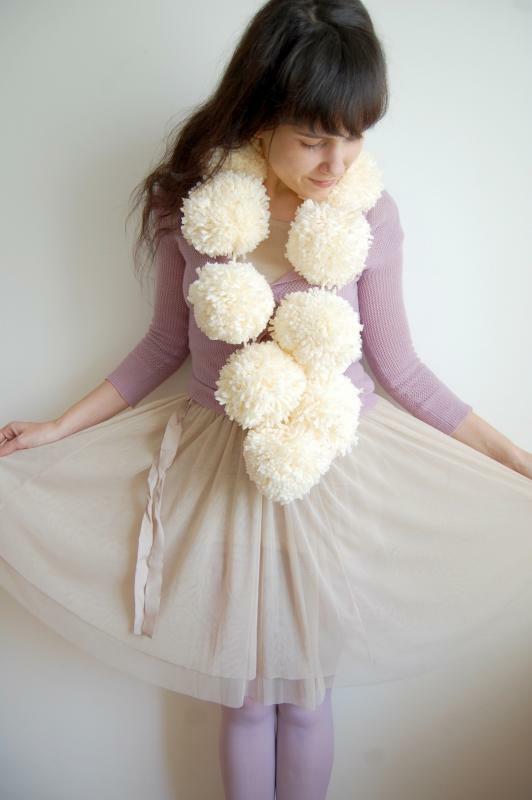 My idea in using two strands was that the pompons could be tucked through the loops to secure the scarf around my neck, so if the idea appeals to you, you might want to check that you can fit a pompon through the gap you leave. 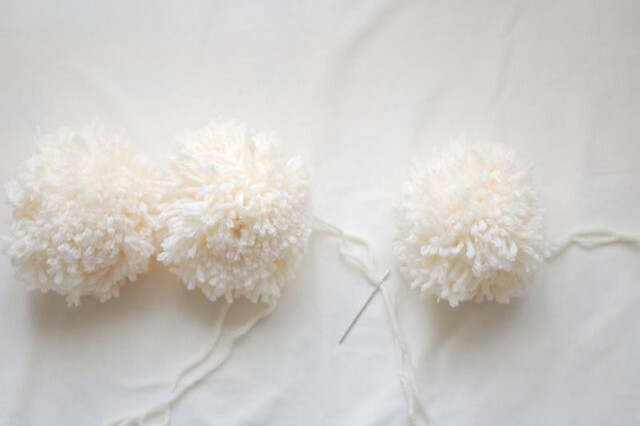 Once the two strands are poking up out of the top of the next pompon, I tied all four strands two-by-two to each other. 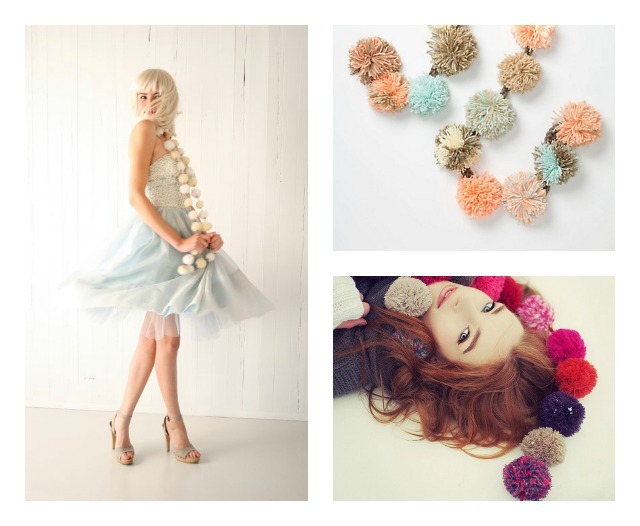 Just keep knotting until the pompon is secure and can’t slide up or down. Then repeat the same for all the other pompons. 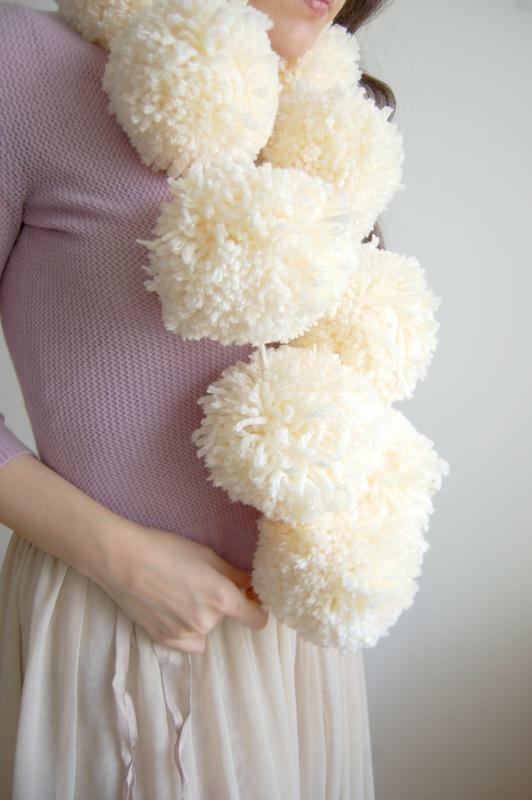 When not around your neck, pompon scarves make really lovely garlands you’ll want to fondle constantly. 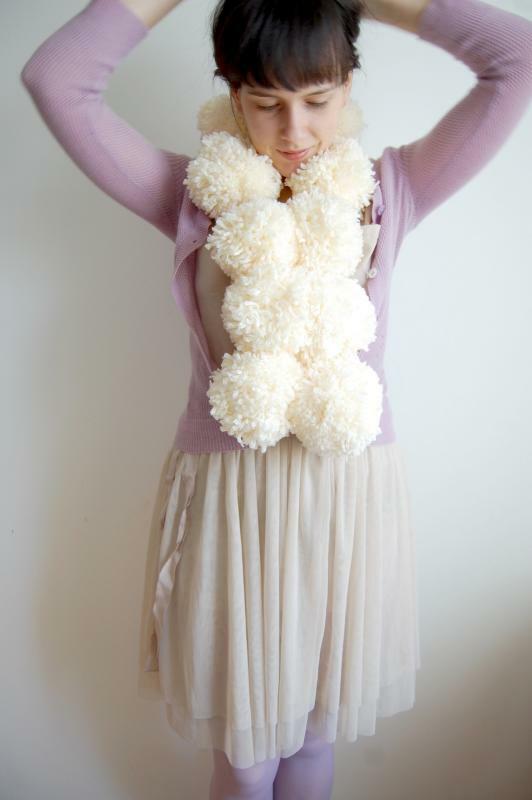 10th February, 2013 // How To, Style // tags: free, pompom, pompon, scarf.